Eating leftovers - yes or no? Do you like cooking enough to have leftovers? Or do you try to cook just enough for one night? 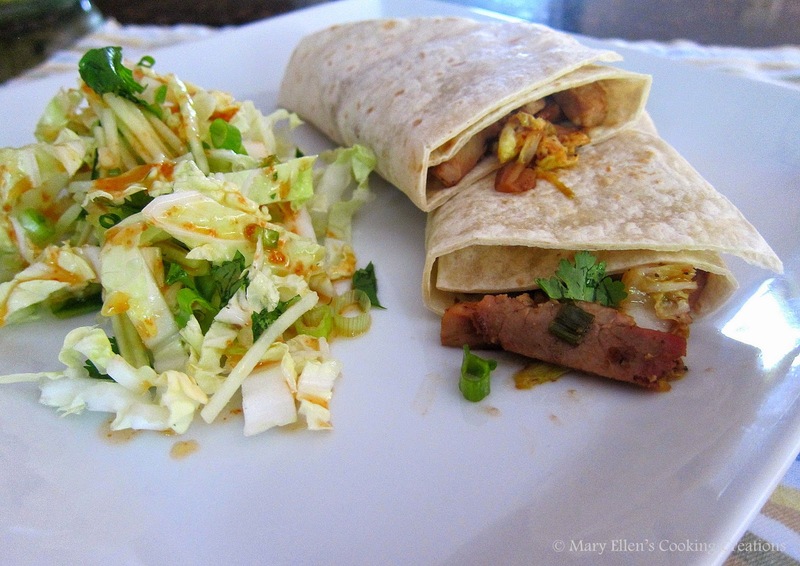 These amazing pork wraps were the result of leftovers. We grilled 2 pork tenderloins one night, and the next night I sliced the leftover tenderloin, added some ingredients and had a completely different dinner with not that much effort. So when you are planning your meals for the week and you write "leftovers" for one night, look around for some recipes that use your original ingredients while giving you a new dish. One of these days I plan on writing a blog post with lots of ideas for leftovers - stay tuned! 1 small grilled or roasted pork tenderloin. The one I used had been marinated in teriyaki sauce and garlic before grilling it. Slice the tenderloin into 1 inch thick slices, and then slice into strips. Mix the hoisin, soy sauce, sesame oil, and rice vinegar. Set aside as you will use this at the end. Heat half of the oil in a large sauté pan. Add the pork and cook (to reheat) until it starts to brown on the edges, about 3 minutes. Transfer to a large plate. Add half of the remaining oil to the pan. Add the mushrooms and scallion whites and salt; cook, stirring occasionally, until they brown and soften, 2-3 minutes. Push the mushroom mixture to one side of the pan and add the eggs. Cook, scrambling and breaking up into small pieces with a wooden spoon or spatula, until just set, about 1 minute. Transfer everything to the plate with the pork. Add the remaining oil to the pan. Once it's hot, add the scallion greens, cabbage, ginger, and garlic. Cook, stirring occasionally, until softened, about 2 minutes. Add the hoisin mixture and the pork mixture to the pan and stir. Cook, stirring occasionally, for 1 minute to mix the flavors. To serve - spread some hoisin sauce in the center of the tortilla. Top with a generous amount of the pork mixture, and wrap burrito style. These wraps were so good that I may just make a pork tenderloin this weekend JUST so I can have these leftovers on Monday! I served them with this Napa Cabbage and Cucumber Slaw.